Philadelphia Eagles head coach Doug Pederson still needs a third-string quarterback. 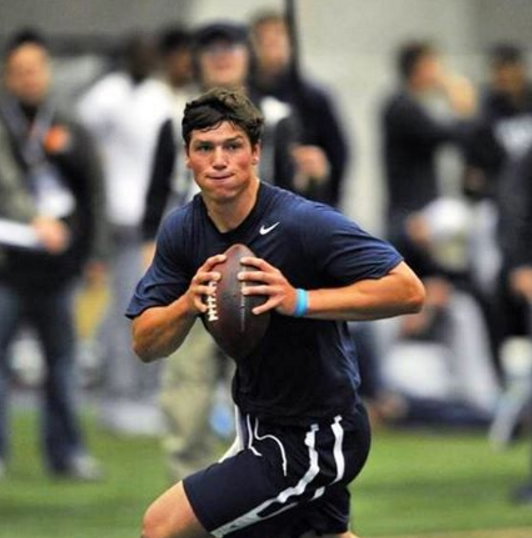 Could it be Christian Hackenberg? The Penn State signal-caller had a strong showing at his Pro Day on Thursday and the Eagles were the first to approach him after he completed his workout, according to multiple reports. Hackenberg, who had an inconsistent combine in Indianapolis, bounced back in a huge way. Check it out for yourself. StateCollege.com‘s Ben Jones said that he completed 44-of-52 passes, which included a stretch of 21 straight tosses that didn’t hit the turf. Hackenberg finishes 44-52 with a streak of 21 straight completions and more than a few "wows" from the crowd. Penn State Pro Day is a wrap. Consensus: Christian Hackenberg helped himself. "No doubt. He threw the ball great," one NFL evaluator said. The holder of Penn State’s career passing record, Hackenberg, threw for 8,457 yards with 48 touchdowns and 31 interceptions over 38 games in State College. He was also sacked 103 times during his career working behind a shoddy offensive line. Here’s what he posted on Instagram. Philadelphia signed Sam Bradford to a two-year deal earlier this month and backup Chase Daniel to a three-year pact last week, but it might decide that Hackenberg is worth using a draft pick on as a quarterback to develop for the future. Did LeSean McCoy Cost Chip Kelly His Job?